Some Chinese enterprises in Dandong, a city in northeastern Liaoning province bordering North Korea, stopped sending back North Korean workers to their home country, South Korea’s intelligence sources said on Monday. South Korean government said it is identifying intelligence that the average daily traffic volume between Dandong and North Korea surged to 50 trucks, from 20 to 30 trucks earlier this year. The traffic in this region is one of the key indicators that show bilateral trade flows. More than 100 trucks a day would come and go before the international community strengthened sanctions against the North. According to data released by China’s customs agency, North Korean exports to China amounted to 1.72 billion dollars, a 33 percent down from 2016. However, Beijing is likely to give some breathing space to its ally as Chinese President Xi expressed his willingness to expand mutual exchanges in a meeting with Kim. ORIGINAL POST (2018-3-30): I am still of the opinion that “maximum pressure” has not been the primary cause of North Korea’s newfound desire to hold talks with the US and South Korea. However, this article in the FT argues that China has enforced trade restrictions on North Korea in excess of the UNSC resolution requirements, and perhaps this policy played a role in bringing Kim Jong-un to Beijing. Official Chinese statistics show that the monthly average of refined petroleum exports to North Korea in January and February was 175.2 tons, just 1.3 per cent of the monthly average of 13,552.6 tons shipped in the first half of 2017. Bonnie Glaser points out a rumor that these stringent trade caps will be lifted to the point that China is still in compliance with UNSC resolutions. North Korea’s imports of smartphones, notebook computers and other high-tech products have risen sharply in recent years despite international sanctions following the country’s nuclear and missile tests, a report said Thursday. High-tech goods accounted for 12.1 percent of the North’s total imports of manufactured products in 2016 from 6 percent in 2007, according to a report written by Kim Yang-hee, an official of the Ministry of Strategy and Finance. The report is carried in the March 2018 edition of the Korea Development Institute’s North Korea Economic Review. The report was written based on statistics released by the North Korean government. The high-tech goods include smartphones, PCs, automobiles, and aviation and space technology products. The proportion of telecommunication and electronics goods also rose to 10.2 percent in 2016 from 3.9 percent in 2007. The report noted North Korea failed to ship coal to China since October last year when the United Nations sanctions on North Korea toughened. North Korea’s grain imports from China last year showed a threefold increase over the same period of the previous year. Having analyzed a set of data released by the Chinese General Administration of Customs, Tae-jin Kwon, a South Korean expert on North Korean agriculture and the head of the Center for North Korea and North East Asia Studies of the GS & J Institute, disclosed this analysis to the Voice of America on February 14. This means North Korean grain imports have more than tripled from 54,683 metric tons imported in 2016—the amount of imports totals $67.33 million, a 2.3-fold increase from $27.91 million in the previous year. Wheat flour (81, 654 tons) made up 46 percent of the total North Korean imports, accounting for the largest part of the imports. This is followed by corn (57,887 tons) and rice (36,408 tons), along with starch and soybeans. In particular, corn imports grew more than 16 times compared to 3,125 tons the year before, and flour imports, which stood at 7,000 tons in the previous year (about twelvefold). During December 2017, North Korea’s grain imports from China grew more than four times the amount it imported in the same period a year before. In particular, imports of flour increased to 25,000 tons, more than 22 times from the same period last year. Last year, as the crackdown on the DPRK-China border tightened due to the international sanctions on North Korea, formal grain imports seem to have increased while the informal imports were restricted. Although North Korea’s grain production in 2017 seems to have declined slightly from the previous year, its grain imports from China are expected to remain at the same level. In yet another so-called “strong signal”, China’s commerce ministry said on Saturday it won’t be importing any more coal from North Korea for the rest of the year. Remember, that coal that was already basically supposed to not be imported after last year’s sanctions (save for that generating revenue for humanitarian purposes). And the imports of which was already supposed to be capped at a low monetary limit. And so on and so forth. Of course, as a usual caveat this time could be different but whether or not this decision will be enforced, and how strictly, remains to be seen, to put it mildly. China has other concerns in its relationship with the Korean peninsula and North Korea than signalling its commitment to the international community. Moreover, as I have written before, there are many factors that impact Chinese imports of North Korean coal than central government decisions. Domestic demand is one, and has probably played a greater role than diplomatic considerations over the past few years. Other than the missile launch, one could suspect this is also a signal against the killing of Kim Jong-nam, who lived under Chinese protection. China’s commerce ministry said Saturday it will suspend the import of North Korean coal, apparently in response to the latest provocations made by Pyongyang. Beijing’s Ministry of Commerce said the decision, which comes into effect on Sunday, is in line with the United Nation’s sanction against North Korea. The suspension will be valid through Dec. 31, the ministry added. “As coal takes up a significant portion of Pyongyang’s trade with China, the decision is anticipated to have a significant impact on North Korea,” an expert on China said. Coal is estimated to take up 40 percent of North Korea’s exports to China. China had banned imports of coal from North Korea in April last year, but had been making exceptions for those intended for household use, which led to criticism over the regulation’s effectiveness. North Korea fired a new intermediate-range ballistic missile (IRBM) called the Pukguksong-2 on Sunday from an air base in the country’s northwestern province toward waters off its east coast. When the UN Security Council imposed the cap on coal trade, China was left with the question of how such a cap could be implemented. Would there be an auction system for quotas? Is it able to track forward contracts or does it only know belatedly the level of coal trade after import figures come out? This problem came to the fore last year when the Chinese were unable to meet their commitments regarding the import cap as they wrestled with these problems. China has generally chosen to ensure adequate flexibility in the wording of UNSC sanctions to give it wiggle room, rather than outright violating those rulings. Allowing a coal cap to pass at the UNSC indicates their willingness to adhere to the ruling. In imposing a ban for 2017, China probably took into account rapidly rising coal prices and a probable rush by companies to frontload sales ahead of the cap to predict that the coal cap would be breached far earlier in the year. Rather than risk a violation of the coal cap limit, China is proactively clamping down on trade. Domestic concerns might also play a part. China is restricting domestic production of coal. Between domestic producers and North Korean ones, China obviously prefers the former. According to KITA, China’s exports to North Korea came to US$193 million in July, plunging 27.6 percent from the same month last year. Last month’s decrease is the biggest drop in China’s exports to North Korea this year. Along with exports, China’s imports from North Korea also dropped by 5 percent from a year ago to come in at US$227 million, the data showed. KITA attributed the changes to China’s sanctions against Pyongyang, and to North Korea’s dwindling foreign reserves. China has been limiting trade with North Korea since April. China’s northeastern province of Jilin saw its imports from North Korea plunge nearly 15 percent in the first quarter of 2016 from a year ago, data showed Wednesday, dealing a fatal blow to the neighboring country’s moribund economy. According to the Chinese customs data, Jilin’s trade with North Korea sank 14.7 percent on-year to US$176 million in the January-March mainly because of plunging imports. Jilin, which borders the North’s three provinces, is China’s hub of trade with its ally and boasts the largest trade volume with Pyongyang among China’s provinces. Jilin’s imports from North Korea came to $66 million in the three-month period, down 33.8 percent from a year earlier. Tumbling imports of such major items as iron ore, clothing and fisheries goods led the drop. Imports of North Korean iron ore dipped 19.3 percent on-year to $7.28 million in the first quarter, with those of clams, T-shirts and functional clothing nose-diving 25 percent to 73 percent. China experts said Jilin’s imports of iron ore from North Korea fell sharply in the first quarter due to sluggish demand from China in the wake of Beijing’s move to eliminate its steel overcapacity. U.N.-led international sanctions on North Korea for its nuclear and missile programs seemed to play a part as well. Pyongyang conducted its fourth nuclear test in January and has test-fired a series of ballistic missiles in recent months. The Chinese province’s imports from North Korea are estimated to have dropped further in the second quarter when the sanctions began to bite, they added. “A tumble in trade with Jilin comes as a serious blow to North Korea as it relies heavily on exports of minerals to the province for external trade,” a North Korea watcher said. Meanwhile, North Korea’s overall trade with the world’s largest economy dropped 9.3 percent on-year to $2.31 billion in the first half of this year, with exports and imports falling 3.1 percent and 16 percent each. But in April, Chinese imports of the high-quality smokeless coal anthracite from North Korea plummeted, according to data from the Korea International Trade Association (KITA) in Seoul which sources Chinese import receipts. Shipments of 1.525 million tons were down 35 percent – albeit compared to record highs in March – and 21 percent compared to the same month last year/compared to April last year. Then, after just one month, Beijing’s toughness on Kim Jong Un appeared to dissipate. Since April, Chinese imports of North Korean coal – worth 40 percent of total export earnings – have begun to return to normal levels. In May, imports of anthracite were up 1.7 percent on the low of the previous month but still down 15 percent on May 2015, KITA data showed. This recovery continued into June. China’s imports of anthracite rebounded nearly 22 percent, coming out of the trough of April and May, and were down just 5.6 percent on May 2015. While China is trying to cap and reduce coal use – consumption fell for the second year in a row in 2015 – its demand for anthracite to produce metals remains high. China’s total coal imports slumped 30 percent last year as the government emphasized other cleaner energy sources. This, in turn, pushed down the domestic price of coal, also by 30 percent, and as a result, imports were less competitive and shipments to China dropped. But while Chinese coal imports from key suppliers Australia and Indonesia plummeted last year, there was one source country that recorded a 25-percent surge in shipments: North Korea. “This type of coal is in shortage and, in fact, North Korea is the largest supplier of this type of coal to China,” she said. This complex picture has produced confusing and often contradictory reports on China’s sanctions enforcement previously, and especially since Resolution 2270 passed in March. What has become clear, say observers, is that North Korean coal is increasingly reaching China which has, at the same time, turned down negative rhetoric against North Korea. Meanwhile, China remains keen to create the impression it is enforcing UN sanctions as part of its international commitments. Lim Eul-chul, research professor at Kyungnam University’s Graduate School of North Korean Studies said that his contacts in China have hinted that while Chinese customs offices ostensibly claim they are adhering to the United Nations Security Council (UNSC) resolution restricting transactions with Pyongyang, there has been a noticeable easing in oversight by authorities. “Chinese companies who had held back on trading with the North, have started to ship more goods after hearing the news that Seoul-Beijing relations have taken a turn for the worse over the THAAD issue,” the scholar said. He also said that there have been reports of greater traffic moving between the country at night and early morning hours. Lim said that taking into account the customs office operating hours, the flow of traffic at such hours could indicate the illegal movement of goods. This view was echoed by Cho Bong-hyun, an analyst at the IBK Economic Research Institute, who said that people living in the Sino-North Korean border region are saying customs inspections have become lax along the Sino-North Korean border. “There is even speculation that banned items are being disguised as products that are not subject to the UNSC sanctions and are being traded,” he said. Reflecting this, two-way trade data between the neighboring countries support this. Official customs data released by China showed bilateral trade hitting US$503.77 million in June, up 9.4 percent on-year, and the first rebound just three months after Beijing said it will clamp down on trade. The increase is significant because it took place before the THAAD deployment was announced. According to U.S.-based Radio Free Asia (RFA), people in Liaoning Province said that the number of cargo trucks coming out of North Korea on a daily basis has jumped twofold to 20 from just 10 two months earlier. “While trucks only arrived twice a week from North Korea to China just a few weeks ago, they are currently arriving every day, which may be neutralizing the international sanctions,” the media outlet citing a source said. The local said that the traffic involved container trucks. Japan’s Yomiuri Shimbun daily says that China’s oil supply to North Korea appears to have increased. The daily said on Sunday that freight trains traveling from the oil storage facility in Dandong to the Daqing oil field operated once a day when the United Nations sanctions against the North were imposed, but the number increased to two to three times a day from late June. The paper speculated that the change reflects China’s concerns that the Kim Jong-un regime might become unstable under continued international sanctions following the North’s missile launches and nuclear tests. The number of trucks coming out of the North to Dandong has also climbed, energizing trade and overall activity in the border area–so much so, in fact, that some residents have asked whether sanctions on the North have been lifted. Others speculate the reversal is a form of retaliation from Beijing against Seoul for deciding to deploy the U.S. missile defense system THAAD to the South. North Korea’s shipments of natural resources to China that are not on the United Nations’ sanctions list sharply increased in the first half of the year, nearly making up for a decline in shipments of products prohibited by the U.N., a report showed Saturday. Shipments of five mineral resources from North Korea to China came to US$78.2 million in the first six months of the year, up 50.3 percent from the same period last year, according to the report from the North Korea Sources Institute in Seoul. The five minerals are lead ores, zinc ores, spelter, magnesia and cooper ores, which are not on the U.N. list of goods prohibited from access to or from the communist state. The sanctions, under the U.N. Security Council Resolution 2270, were issued in response to North Korea’s defiant nuclear test in January and a long-range missile launch the following month. In the January-June period, China’s imports of seven mineral resources from the North that are prohibited under the U.N. resolution plunged 15.7 percent on-year to $547.2 million. Such a drop accelerated in the second quarter, plunging 25.6 percent on-year as the U.N. sanctions were put in place in March. The prohibited items include coal and iron ores. An institute official, however, noted the drop in China’s imports of North Korean minerals may have come from a dip in China’s own demand for the said natural resources, adding the cut in imports may not necessarily indicate that China is faithfully implementing U.N. sanctions. China is the North’s largest communist ally. Meanwhile, the think tank estimated North Korea’s total coal production for 2015 at 33.8 million tons, up 12.2 percent from a year earlier. It put the estimate of the country’s iron ore production at 4.26 million ton for 2015, down 25 percent year-on-year. Volumes of anthracite shipped to China in June increased from 1.5 million tonnes to 1.8 million. The number is higher than both January and February export totals and consistent with a recent trend which saw North Korea export more coal to its neighbor in order to combat low commodity prices. Chinese traders paid their North Korean counterparts over $88 million for the coal in June, a $14 million increase over the previous month. While the figures are down compared to their March equivalents, those were record exports for the DPRK at 2.3 million tonnes. Shipments of North Korean iron ore showed an even more pronounced rise after the UN passed Resolution 2270. While volumes are smaller, North Korean iron ore exports increased more than 100 percent between April and May. June’s exports also increased, but at a slower rate to over 221,000 tonnes. The number is more than double the March export figure, and continues a theme of month on month increases beginning in April. Exactly how Beijing has set about enforcing the new sanctions is currently unclear. Resolution 2270 contains an exception allowing iron and coal imports provided the revenues do not contribute to the North’s weapons programmes. But how the process works is currently vaguely defined, and it is unknown how authorities would ensure cash flows from commodity exports go where intended. The increasing exports could also be the result of traders playing out existing contracts, or arise from the difficulties in rapidly shutting down large scale trade. China’s imports of North Korean goods fell 12.59 percent on-year in May, data showed Wednesday, amid tougher U.N. sanctions against Pyongyang’s nuclear weapons and missile programs. Imports from North Korea declined to US$175.6 million last month, compared to $200.9 million for the same month last year, according to Chinese customs data compiled by the Beijing unit of South Korea’s Korea Trade and Investment Promotion Agency (KOTRA). Imports of North Korean coal, which accounts for nearly half of the North’s annual exports to China, plunged 28.3 percent on-year to $74.7 million in May, the data showed. China’s exports to North Korea also fell 5.9 percent on-year to $239.3 million last month, according to the data. However, these numbers suffer from the same problems that often plague trade data on North Korea. We don’t know 1) how much of the decrease is caused by a general, global drop in world market prices for North Korea’s export goods, and how much is an actual, quantitative import decrease, and 2) how much of the drop would have counterfactually happened “anyway,” given the contraction of Chinese industries using North Korean coal. UPDATE 4 (2016-6-3): The Institute for Far Eastern Studies (IFES) also comments on the April 2016 trade statistics. Last month, imports from North Korea to China plunged more than 20 percent below that of the same period last year. April is the first month for China to begin the implementation of sanctions against North Korea adopted by the UN Security Council resolution. China’s sanctions against North Korea have a notable effect. KOTRA Trade Office in Beijing released the official DPRK-China trade statistics of Chinese Maritime Customs Service on May 14. According to this report, China’s total import volume from North Korea in this period recorded 161,380,000 USD, down 22.35 percent compared to April last year. By item, imports of coal decreased by 38.34 percent while lead imports were reduced by 16.12 percent. There were no titanium imports as China listed titanium as one of the banned exports from North Korea. However, iron ore is one of North Korea’s main export items along with coal. Unlike lead and coal, the import of iron ore increased 19.38 percent, and zinc import jumped a whopping 685 percent. In this regard, China appears to have decreased coal imports to deal with domestic overproduction problem of coal while increasing the imports of other minerals and under the suspicion that it is imposing sanctions on North Korea only on the outside. China’s exports to North Korea recorded insignificant decrease of approximately 1.53 percent, with a total volume of 268,000,000 USD. Refined oil including jet fuel was identified to have decreased 6.11 percent compared to the same period last year. Exports of freight cars and electronic equipment decreased 45.46 percent and 43.95 percent, respectively, while agricultural and clothing items were not much affected. As a result, the total of DPRK-China trade volume decreased 10.54 percent compared to last year, at 429,410,000 USD. Last month on April 5, China’s Ministry of Commerce announced 25 banned items of import and export to and from North Korea. This is about a month since the resolution on North Korean sanctions was passed. Since then, China immediately began to impose sanctions. In the list of import bans, there are a total of 20 items, including coal, steel, and iron ore, along with gold, titanium, vanadium ore and other rare earth minerals as classified by maritime customs. Prior to the sanctions, DPRK-China trade in March recorded 490,000,000 USD in trade volume, which was an increase of approximately 20 percent compared to the previous year. As China continues to impose sanctions on North Korea, North Korea can be expected to suffer a significant setback in its foreign currency earnings. Preliminary estimates of trade volume between DPRK and China through April 30 total appx $1.597 billion ($4.791 annualized, 11.7% decrease from 2015). DPRK imports/Chinese exports total $862 million, and DPRK exports/Chinese imports total $735 million. So we can see a bilateral trade deficit in Jan-April 2016 of appx $127 million ($381 million at annualized rate vs $460 million in 2015). Chinese enforcement of UNSC Resolution 2270 reportedly began in April, in which China reports it’s DPRK imports total US $161 million (down 22.3% from April 2015). Coal imports at $72.2 million (down 38.2% from April 2015 total of $116.6 million), gold imports $250k (down 91.1% from April 2015). China’s exports total $268 million in April 2016 (down 1.5% from April 2015). It is impossible to tell from this data whether the sanctions are having any impact beyond the general downturn in the Chinese economy because this is trade based on value (Price x Quantity), and prices of North Korea’s commodity exports have been falling as well. We need to compare the quantity of the prohibited mineral exports over time to see if the sanctions are having any impact (assuming China is accurately reporting them). It is also important to remember that DPRK – China trade is not regular, so past performance is not necessarily indicative of future results. Also, the data can be revised for numerous reasons. Finally, China stopped reporting unrefined oil exports to the DPRK in 2014, but they did not stop exporting unrefined oil itself. According to Chinese customs data, the country exported about 520,000 tons of oil to North Korea every year from 2009 to 2012. Beijing normally supplied between 30,000 to 50,000 tonnes (222,000 to 370,000 barrels) of crude oil to North Korea every month. Shipments of crude oil to North Korea rose 11.2% to 578,000 tons in 2013. China’s imports of North Korean products declined more than 20 percent last month compared to the same period of 2015 as Beijing began to implement UN Security Council sanctions against Pyongyang. According to statistics by the Korea International Trade Association, China imported US$161 million worth of North Korean products in April, down 22.3 percent on-year. Its imports of North Korean coal fell 38.2 percent to $7.21 million [this statistic is wrong and was corrected by Yonhap], and of gold 91.1 percent to $250,000. Imports of North Korean titanium, which is on the list of banned imports, were zero. But imports of iron ore, which is allowed since it is thought to support the livelihood of ordinary North Koreans, increased 1.7 percent, and of zinc, which is also not banned, a whopping 685 percent to $5.7 million. China’s exports to North Korea totaled $268 million last month, down 1.5 percent. Sales of jet and rocket fuel dropped 39.9 percent and of cars and electronic equipment 45.5 percent and 43.9 percent. Total trade between North Korea and China last month fell 10.5 percent on-year to $429 million. If China continues to abide by UN Security Council sanctions against North Korea, bilateral trade will shrink further and dent the North’s attempts to earn hard currency. China’s imports of coal from its neighbor North Korea reached 1.53 million tonnes in April, down 35 percent on the month and 20.5 percent year-on-year as Beijing sought to comply with a tougher sanctions regime against the country. North Korean shipments over the first four months of the year remain 23.2 percent higher than the same period of 2015, data from China’s General Administration of Customs showed on Monday. China’s Ministry of Commerce announced at the beginning of April that it would ban North Korean coal imports to comply with new United Nations sanctions on the country, though it made exceptions for deliveries intended for “the people’s wellbeing” as well as coal originating from third countries like Mongolia. Mongolia was the chief beneficiary of the decline in shipments from North Korea, with the country supplying 1.98 million tonnes to China in April, up 34.7 percent on the year. Australia remained China’s biggest supplier, though the April volume of 5.74 million tonnes was down 12.9 percent compared to last year. Trade volume between North Korea and China posted double-digit growth in the first quarter of 2016 from a year earlier despite the United Nations’ punitive economic sanctions imposed on the reclusive country, official data showed Wednesday. The size of bilateral trade stood at 7.79 billion yuan (US$1.2 billion) in the January-March period, up 12.7 percent from the same period last year, Huang Songping, spokesman of China’s General Administration of Customs, said during a press briefing on the country’s first-quarter trade outcome. The increased trade volume is attributable to a sharp rise in China’s exports to North Korea in the three months, which posted 14.7 percent growth to 3.96 billion yuan, according to the spokesman. On the other hand, China’s imports from North Korea contracted 10.8 percent to 3.83 billion yuan, he said. “Major Chinese exports to North Korea are machinery, electronic goods, labor-intensive products and agricultural goods, while imports mainly are coal and iron ore,” Huang said. The spokesman indicated that the trade increase should not be viewed as China circumventing the U.N. Security Council sanctions because the latest figure accounts for bilateral trade volume before the sanctions took effect. China immediately implemented the sanctions after it announced a list of banned trade goods with North Korea on April 5, the spokesman pointed out. Another official from China’s State Council stressed any trade items that concern the public welfare or have no link to North Korea’s nuclear weapons development are not subject to the sanctions. But the official refused to release the monthly trade figure for March, only saying that the monthly data is not available. In early March, the U.N. adopted the toughest sanctions it has ever slapped on North Korea as punishment for the communist country’s defiant nuclear test in January and a long-range rocket launch in February. (1) Trading that is determined to be conducted to generate profits solely for the people’s livelihood, and that does not involve the nuclear program or the ballistic missile program of the DPRK or any other profit generating activities prohibited in the Resolutions No. 1718(2006), No. 1874(2009), No. 2087(2013), No. 2094 (2013) or No. 2270 (2016) of the UN Security Council. If the import falls into the range of the trade mentioned above, then during the import declaration, the enterprise shall submit to the customs authority a letter of commitment (See Annex 2) signed by its legal representative or principal and affixed with its official seal. If it is confirmed by solid information that the imports are not for the people’s livelihood, or are related to the nuclear program or the ballistic missile program of the DPRK, the customs authority will not clear such imports. (2)Trading of coal that is confirmed not to be originated in the DPRK but is delivered and used to export from the Port of Rason through the DPRK, and such trade does not involve the nuclear program or the ballistic missile program of the DPRK or any other profit generating activities prohibited in the Resolutions No. 1718(2006), No. 1874(2009), No. 2087(2013), No. 2094 (2013) or No. 2270 (2016) of the UN Security Council. If the import falls into the range of the trade mentioned above, the importing enterprise shall submit to the provincial competent commerce authority, where such enterprise is located, relevant information and application in advance, which shall then be submitted to the Ministry of Foreign Affairs via the Ministry of Commerce, and then notified to the Sanctions Committee of the UN Security Council for record-filing before the enterprise can begin to import. During the import declaration, the enterprise shall submit to the customs authority a letter of commitment (see Annex 3) signed by its legal representative or principal of the enterprise and affixed with its official seal and the certificate of original. If it is confirmed by solid information that the trade does not fall into the exception, then the customs authority will not clear the imports. 2. Imports of gold ores, titanium ores, vanadium ore, and rare earth minerals from the DPRK are forbidden. (1) The aircraft fuel that has been specially approved by the Sanctions Committee of the UN Security Council case by case to be transferred to the DPRK and verified to be used to satisfy basic human needs; however, special arrangements must be made to effectively monitor the delivery and use of such fuel. (2) The aircraft fuel that is sold to civil airplanes outside the territory of the DPRK or is supplied solely for use in trips from and to the DPRK. 4. For details of the product embargo, please see Annex 1. This Announcement shall be implemented as of the date of announcement. China’s commerce ministry on Tuesday announced a list of restrictions on imports from North Korea and said it will ban the export of jet fuel in accordance with new U.N. sanctions slapped on Pyongyang following its latest provocations. Backed by China, the U.N. Security Council adopted a package of fresh sanctions on North Korea earlier last month to punish the North for conducting its fourth nuclear test in January and launching a long-range rocket in February. The Chinese announcement said it will continue to import North Korean coal, iron, and iron ore if such transactions are involved in “livelihood purposes” and their revenues are not used for North Korea’s nuclear and missile programs. “If credible information confirms that any deal is not for livelihood purposes or in connection with North Korea’s nuclear or ballistic missile programs,” the Chinese customs authorities should not release such mineral items, a statement released by the Chinese ministry said. Many analysts say the reference to “livelihood purposes” in the new U.N. sanctions could allow China to continue the trade of coal and iron ore with North Korea. The Chinese list of restrictions on mineral imports from North Korea also includes titanium and vanadium. In line with new U.N. sanctions, China also prevents their nationals from selling or supplying jet fuel to North Korea. But the provision will not apply if there is a humanitarian need, or for civilian passenger aircraft outside North Korea during a return flight to North Korea, the Chinese statement said. Earlier in the day, South Korean Ambassador to China Kim Jang-soo told a group of South Korean correspondents that the new U.N. sanctions have so far left no specific impact on bilateral trade between North Korea and China. “No specific figures, including changes in North Korea-China trade volume and (China’s) import volume of (North Korean) coal, have been reported yet,” Kim said. Kim said China will submit a report about its implementation of the new sanctions on North Korea within 90 days of the sanctions being adopted. The Chinese report to the U.N. will become the “standard” in assessing whether or not China is sincerely enforcing the new sanctions on North Korea, Kim said. China on Tuesday announced embargoes on some imports from and exports to the Democratic People’s Republic of Korea (DPRK). In terms of imports, China has banned purchases of coal, iron ore and several other raw minerals, and exports of aviation fuel to DPRK are also no longer allowed. The bans follow the UN Security Council’s resolutions, the Ministry of Commerce said. Trade between North Korea and its economic lifeline, China, grew 4.6 percent on-year in February, Chinese customs data showed Wednesday, despite tensions over the launch of a long-range rocket following the North’s fourth nuclear test. Bilateral trade volume stood at $323 million last month, according to the data. China’s imports of North Korean goods gained 2.48 percent on year to $162 million and its exports to the North rose 6.91 percent to $161 million. Compared with January, however, bilateral trade fell about 15 percent. The U.N. Security Council imposed tougher sanctions on North Korea earlier this month to punish it for the Jan. 6 nuclear test and Feb. 7 launch of a long-range rocket, both of which violated previous U.N. resolutions. China, which accounts for nearly 90 percent of North Korea’s external trade, has vowed to fully implement the new U.N. sanctions on North Korea. But, China has also made it clear that sanctions should not affect the normal trade between the two nations. To what extent is China enforcing the latest round of UNSC sanctions on North Korea? This question is as important and interesting as it is nebulously complicated and difficult to answer. For the fact is, like Curtis points out here, that lower coal imports by China from North Korea does not necessarily give evidence to sanctions enforcement. Some of the figures reported in the news concern the value of the imports, which fluctuates with world market prices. Moreover, as the old saying goes, correlation does not imply causality. In other words, the mere fact that trade in coal and other goods is decreasing does not necessarily mean that it is going down because of sanctions alone. It is worth to remember that Chinese imports of North Korean coal has decreased in the past too, before the latest sanctions round, due to decreased domestic demand and other factors. A whole host of variables other than sanctions may well be at play too. Looking back at some previous trade data gives some context to the latest reports of decreasing trade. Even though volumes may be down, to fully understand how this impacts the North Korean economy, dollar value terms may be more relevant. According to recent data, Chinese imports of North Korean coal have decreased by 20.5 year-on-year for April 2016 (in tonne numbers). According to Yonhap figures, cited here, this translates into a drop from $116.6 a year ago, to $72.27 now. This represents a 37 percent drop. In the pre-sanctions quarter of the year, North Korean exports to China increased by 12 percent. Between January and November 2014, North Korean exports to China dropped by 12.3 percent in dollar terms. Between 2013 and 2015, the value of coal exports to China dropped by 24.6 percent. Between January and February 2014, total trade between North Korea and China dropped by 46 percent. The point of citing these numbers is not to show that sanctions are not being implemented by China. Rather, such flows tend to fluctuate quite heavily for other reasons as well, and it is too early to conclude that sanctions are the only reason behind the contraction. As a New York Times story from late March this year showed, Chinese border agents tend to be fairly lax in controlling goods crossing the border – NYT cited a figure of about five percent of all goods being inspected. In sum, it is too early to draw any major conclusions about Chinese sanctions enforcement, and only future data will be able to give a more conclusive picture. Trade with North Korea is expected to be practically zero this year now the joint Kaesong Industrial Complex has been shut down. According to a 2016 White Paper published by the Unification Ministry on Thursday, last year’s cross-border trade volume was a record US$2.7 billion, up 15.9 percent from 2014, thanks to an increase in trade through the industrial park. But that accounted for 99.6 percent of all cross-border trade since other trade had already been suspended under earlier sanctions in the wake of the sinking of the Navy corvette Cheonan in 2010. Now the industrial park has been closed there is no trade left, the ministry said. Since the North’s latest nuclear test in January, Seoul has also halted humanitarian aid to the North. Last year, Seoul gave Pyongyang humanitarian aid worth W25.4 billion, up 30 percent from 2014 (US$1=W1,167). In 2015 North Korean-Russian bilateral trade volume decreased by 10% and reached 83.2 million USD compared to 92.2 million USD in 2014. North Korean exports to Russia fell to 5.7 million USD (by 43%) while imports fell to 77.5 million USD (by 6%) . Figure 1. 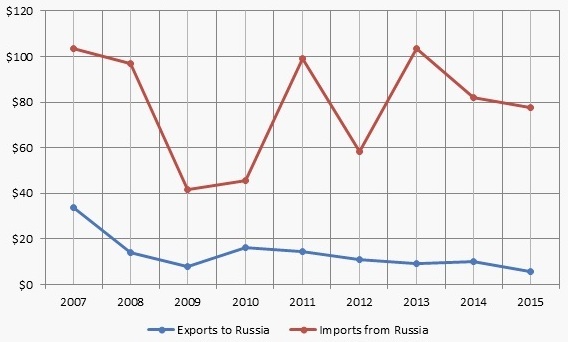 2007-2015 North Korean-Russian bilateral trade turnover, million USD. Source: ITC Trade Map. 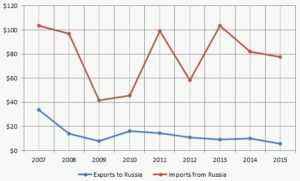 In 2015 the imports of North Korean made products in Russia experienced a significant rise . The imports of man-made filaments rise by 8733%; the imports of railway, tramway locomotives, rolling stock, equipment- by 5283%. 2015 showed a significant rise in Russian exports to North Korea of cereal, flour, starch, milk preparations and products (+706%). At the same time the exports of machinery, nuclear reactors, boilers (-97%) showed a significant fall. I have posted a PDF of the source web page here. North Korean trade with Russia decreased sharply in the first quarter of 2015, according to data from the ITC Trade Map, despite continued attempts to improve bilateral economic cooperation between the two countries. Both imports and exports between Russia and North Korea fell in the first four months of 2015 compared to 2014 numbers. Exports from North Korea to Russia fell from more than $3 million in the fourth quarter of last year to approximately $500,000. The drop was mostly on the back of a big reduction of machine and clothes exports to Russia. While the latter group also appears to fluctuate based on the season, imports in the first four months of 2015 were also lower than those a year earlier. Exports from Russia to North Korea account for the largest share of trade between the two countries, and also fell in the first quarter. Overall, Russian exports fell by nearly 20 percent so far in 2015, compared to last quarter of 2014. At $17 million, the figure was 70 percent of that in the same period last year. North Korea’s lower imports from Russia were mainly due to a large decrease in food imports. Throughout the last six months of 2014, the DPRK imported more than $12 million in cereals from Russia, but these imports appeared to cease in 2015. The overall numbers dropped despite an uptick in North Korean imports of Russian coal. The figures continue a trend of decreasing trade between the two countries. From 2013 to 2014 trade values also fell, but were not as low as the most recent 2015 figures. The news comes despite a flurry of diplomatic and political exchanges between the two countries geared towards increasing economic cooperation and trade, with Russia setting a target of $1 billion in trade by 2020. You are currently browsing the archives for the Trade Statistics category.